Excellent production quality and amazing attention to detail. 60 years ago, thousands of freshly trained US pilots crossed the atlantic ocean to form what was to be the largest air armada ever amassed. One of the unique feature of these young men was that most were conscripts, bringing with them talents they had acquired during their civil years. Rarey got married before his dispatch, fathering a son that he sadly never met, having been killed in action on June 27th 1944 over Normandy. Rarey's sketches were first published online by his son Rarey and then served as the basis of the book "Laughter and Tears" he authored in 1996. Ever since i discovered his story and bought the book, i have been fascinated by the beautiful nose arts he created, his own's airplane "Damon's deamon" being my personal favorite. A first decal sheet for this airplane and few other from the group was done by Chris Bucholtz for the IMPS 1998 convention but these are no longer availables. Here come Roy Sutherlands and Barracuda Studios to the rescue. 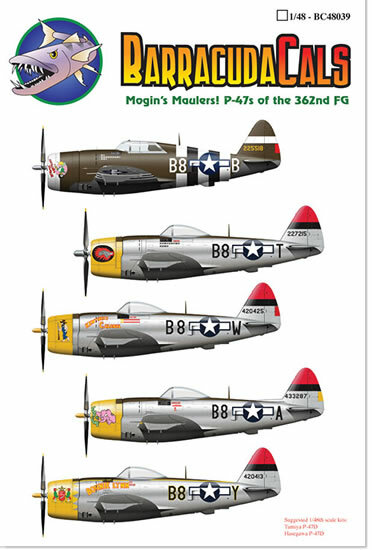 Using Chris's research as the basis and new material uncovered since 1998, he proposes us a new P-47 decal sheet dedicated to planes of the 362nd Fighter Group, known as the "Mogin's Maulers"
All the a/c have been meticulously researched and full markings are provided for each a/c. Barracuda studios provides a full set of stencils and national markings, enough for one a/c. So while all a/c can be modelled with the sheet, the modeller will have to source elsewhere these missing items. Decals have been printed by Cartograph in Italy and exhibit their usual quality. Colors are gorgeous and markings are perfectly registered. Applying them should present no challenge and they should blend flawlessly. Highly recommended, as all Barrucada Studios products !